Fish exports are growing fast after the six-year-old EU ban was lifted on shipments to EU member countries in March this year and due to larger sales in China and Vietnam. Exports of fish and fish preparations exceeded 36,000 tonnes during July-September, up 33 per cent from where they stood in a year-ago period. Earnings from foreign sales also rose 34 per cent to $85 million. Earlier, between April and June, exports volumes had gone up 18 per cent to about 50,700 tonnes though earnings at $100 million showed a small increase of four per cent. This rising trend in seafood exports is expected to continue and exporters hope that in FY14 the earnings may reach closer to $400 million from $317 million in FY13. The resumption of shipments to EU countries, ever-deepening penetration into Chinese market and larger foreign sales of frozen fish and crustaceans, like shrimp and lobsters, indicate that seafood exports would keep growing in coming years. In FY13, about one-third of total seafood export earning, or $100 million in absolute terms, originated from China and Vietnam. �Exports of salted, dried and smoked fish to China are growing by leaps and bounds,� says a Karachi-based exporter. �Besides, demand for fresh or chilled fish and frozen fish is also on the rise. If exporters tap the potential cleverly our sales to China alone can fetch $60 million or so during this fiscal year. An equal amount can come from Vietnam where we sell lots of frozen fish as well as shrimp and lobsters, etc.�Other major markets for Pakistani seafood include Thailand, South Korea, Saudi Arabia, Indonesia, Malaysia, Bangladesh, Egypt, Hong Kong, Japan, Kuwait and the UAE, etc. Fish exporters demand that Trade Development Authority of Pakistan (TDAP) must build up a dedicated harbour for shrimp peeling plants, start providing finances for import of fishing nets and for construction of fibre glass fishing boats, install large power generators at Karachi Fish Harbour to ensure uninterrupted supply of electricity and develop Ibrahim Hyderi fish harbour on modern lines to boost seafood exports. They say TDAP can undertake these and similar projects out of the export development fund it collects from exporters. The issue was raised in a recent meeting between top seafood exporters and officials of Karachi Fish Harbour Authority, Marine Fisheries Department and TDAP but the Authority is yet to respond to this proposal. Exporters say lately exports of shrimp and lobsters saw an impressive 30 per cent growth in FY13 and even faster growth is expected from now onwards, after the reopening of the EU market. They say that timely setting up of shrimp peeling plants harbour can help tap growing demand. With a coastline of 800km plus, Pakistan�s fishery resources are enormous, but only a fraction of it has been exploited so far. Lack of investment is a big impediment. Several studies have pointed out that in Pakistan�s jurisdiction in the Arabian Sea commercial species of crustaceans like shrimp and lobsters have been overexploited. �Now, there is a need to develop marine nurseries of shrimp and lobsters along the coastline in such pre-identified areas where relatively less fishing activities take place to ensure future supplies,� says a leading Karachi-based exporter. Lately, whereas export volumes of seafood have gone up, the per unit export prices have remained either stagnant or showed a nominal increase. There are two reasons for this: Tuna fish, the most expensive among all, is not caught in big volumes. Besides, its processing is not as good as in Japan, for example, which helps fetch higher per unit price of the fish and its preparations. Though other expensive fish like Salmon, Hilsa Rahu, Dhotar, Mushka and Kund are found in great quantities, lack of technology blocks their advanced processing and packaging. This too lowers their per unit prices. Officials of fisheries department point out that in the last few years, local consumption of fish, both marine and inland, has been on the rise � thanks to increased awareness among people about their health benefits. This means export-led local purchases have become costlier, leaving lesser margin for exporters who compete fiercely with such fish-producing countries like Bangladesh, Maldives, India, China and Vietnam. 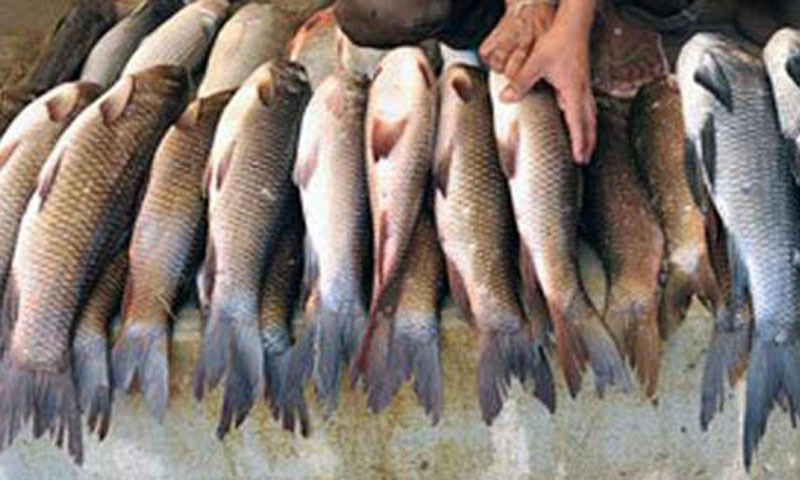 Exports of Iranian fish varieties that had started threatening Pakistani exporters have shrunk, due to difficulties Iran is facing in external trade because of the US-led trade sanctions. �This has helped us grab a bigger share of the Chinese and other markets including those in Africa,� says another fish exporter from Karachi. According to Economic Survey of Pakistan, total fish production in nine months of the last fiscal year stood around 730,000 tonnes against 725,000 tonnes in the year-ago period. Of this more than 100,400 tonnes of fish were exported and the rest was consumed locally. The rising trend in fish exports seen in the first quarter of this fiscal year indicates that full fiscal year foreign sales volumes would be no less than 140,000-150,000 tonnes. Exporters say that with reopening of the EU market and with high demand for Pakistani fish emerging from China and Vietnam, growth in exports volumes would remain strong, creating the need for boosting fish production. People associated with fishing business say currently 65 per cent of total fish production is through inland resources i.e., rivers and fishing ponds and only 35 per cent of it comes from marine sources. �Since exports are dominated by marine fish, there must be a comprehensive plan to allow faster breeding of marine fish besides making moves to save them from dying due to marine pollution,� a senior official of Sindh fisheries department told Dawn. One major roadblock in increasing seafood exports is growing cost of transportation of fish from Balochistan to Karachi. Officials say this issue can be addressed in two ways.